blue MA-274-CR2B-001 2 x 900 10 pcs 5 pack. red MA-274-CR2R-001 2 x 900 10 pcs 5 pack. white MA-274-CR2W-001 2 x 900 10 pcs 5 pack. yellow MA-274-CR2Y-001 2 x 900 10 pcs 5 pack. blue MA-274-CR3B-001 3 x 900 10 pcs 5 pack. red MA-274-CR3R-001 3 x 900 10 pcs 5 pack. white MA-274-CR3W-001 3 x 900 10 pcs 5 pack. yellow MA-274-CR3Y-001 3 x 900 10 pcs 5 pack. blue MA-274-CR4B-001 4 x 900 10 pcs 5 pack. red MA-274-CR4R-001 4 x 900 10 pcs 5 pack. white MA-274-CR4W-001 4 x 900 10 pcs 5 pack. yellow MA-274-CR4Y-001 4 x 900 10 pcs 5 pack. 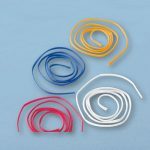 Codoloops® coloured marking bands are sterile by radiation sterilisation – ionising radiation (R) in a process validated in acc. with PN-EN ISO 11137-2. 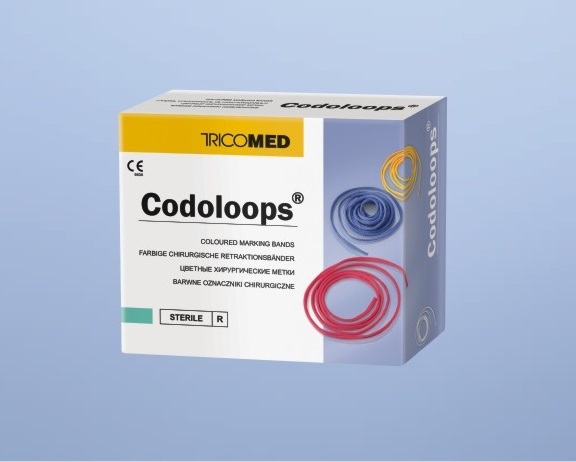 Sterility of Codoloops® coloured marking bands is confirmed periodically with sterility tests. The sterilisation indicators placed on each package prove the product's undergoing the sterilisation process. 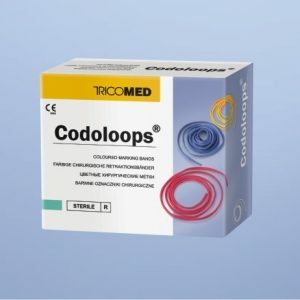 Codoloops® coloured marking bands fulfil all the requirements specified in PN-EN ISO 10993-1 norm and they also possess a number of documented biological tests. Breaking strength - dependently on the size: from min. 90 to min. 200 N - guarantees high breaking strength of the band. 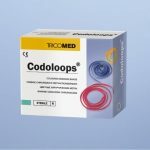 Codoloops® coloured marking bands are packed in medical packages (fulfilling PN-EN ISO 11607 requirements) - paper-foil bags adequate for radiation sterilisation. On the outer packaging there is a TAG label (easy to peel-off, self-adhesive, identifying the device). The transparent package enables having a look into it and inspecting the device. 10 pieces (in one colour) of sterile bands packed in medical packages with the IFU included are placed in a cardboard box. Such package ensures safe storage within the guaranteed validity period.